Innovative artist Karmen Saat finds her inspiration in the ugly and discarded. Her Rotten Beauty collection of ceramics capture the extraordinary textures of rotten fruit. By using strong durable materials to record an ephemeral changing process, Saat is able to capture a unique moment in time while creating gorgeous functional art. Originally from Estonia, Karmen lives and works in London and in Eindhoven, the Netherlands. She recently showed her work at Dutch Design Week and shared her project with us. 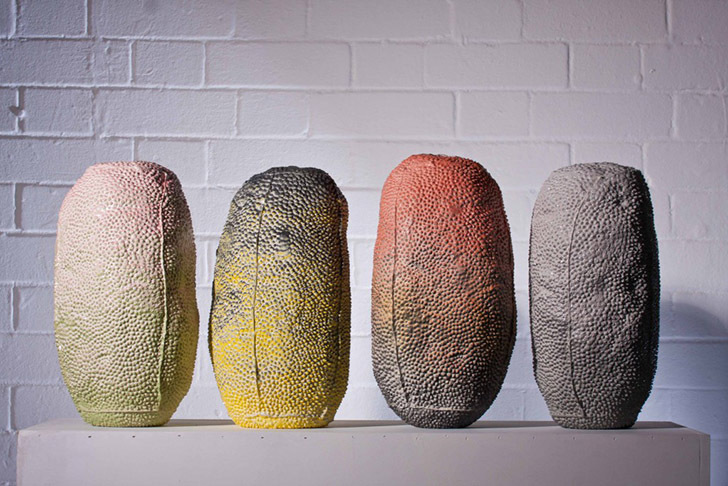 Karmen uses seasonal fruits like strawberries, melons, kiwis and mangoes as models, casting their rotten skins so as to record their extraordinary textures. With her expressive Rotten Beauty collection she aims to challenge people’s perception of beauty, while creating beautiful high quality containers. Her latest addition to her Rotten Beauty collection is the iridescent color illusion series – made by using complementing color gradients — causing the colors to appear change when the pieces are moved up and down. Detailed, expressive and beautiful, Karmen’s work challenges our perception on everyday objects and makes us appreciate the inherent beauty of decadence. With her expressive Rotten Beauty collection she aims to challenge people’s perception of beauty, while creating beautiful, high-quality containers. Originally from Estonia, Karmen lives and works in London and Eindhoven, the Netherlands. She was recently showed her work at Dutch Design Week and enthusiastically shared with us the background to the collection. 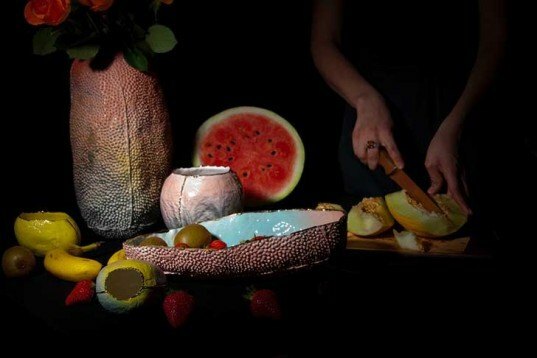 Karmen uses seasonal fruits like strawberries, melons, kiwis and mangoes as models, casting their rotten skins to record their extraordinary textures. Her latest addition to her Rotten Beauty collection is the iridescent color illusion – made by using complementing colour gradients -- making the colors change when the pieces are moved up and down. Detailed, expressive and beautiful, Karmen’s work challenges our perception on everyday objects and makes us appreciate the inherent beauty of decadence.